These pjs are so soft and warm I never want to take them off. I really like this onesie! I am 5'2", 140 pounds & got the M/L. 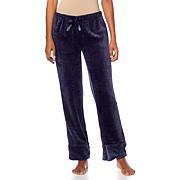 Roomy, but don't want form fitting for lounging. Didn't have to hem sleeves or pants; just right. I cut off the balls & took out string on hood; just got in the way. The high pockets are just for hand warming; not for storing items! I plan to order the Silver. I purchased 4 of these, one for myself and 3 for Christmas gifts, everyone loved them! Soft, warm and cute. I feel like soft and cuddly cat with my leopard print. Purchased last holiday season and came back for more this one. That being said they appear to have been made smaller this year than last so size up as better loose than to tight regulating body movement. I do wish they'd made them a tad longer in legs and arms. Quality of fleece a tad less weighty than last year and colors offered were prettier last year (especially the blue). All that said I do love look, warmth and comfort of them and would purchase again for myself and as gifts.